The day after my 44th birthday, back in September, I started a diet and exercise routine with the intention of losing some weight. Since my second kid was born, I had been hovering around or over 200lbs, which is high even for my curvy body. I got winded from climbing a flight or two of stairs, had a hard time shopping for clothes, and generally didn’t like the feeling of being inside of my own body. That’s not a new experience for me — I’m the survivor of childhood trauma and have struggled with body issues my whole life — but I was inspired by a friend’s weight loss this summer to try to shed some fat again. 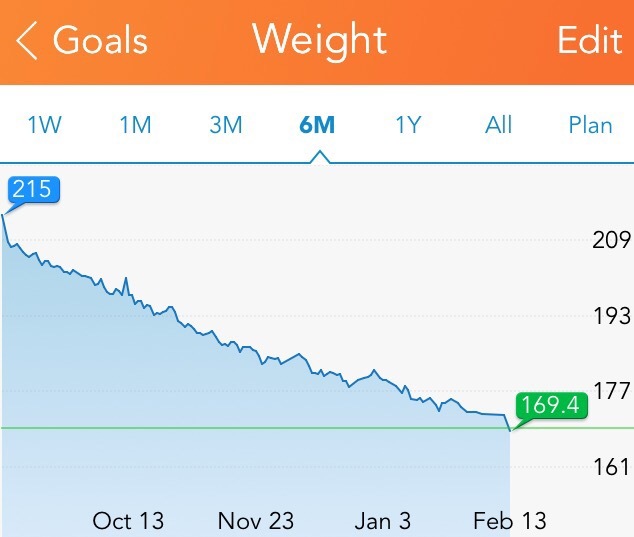 I started logging my food and weighing myself daily using the Lose It! app. I joined exercise challenges in Lose It!, and after about a month got comfortable with a daily exercise routine (with a day or two off per week for recovery). I started running, and actually enjoying it, which was a real shocker. 😉 I found some circuit training and aerobic dance videos on YouTube that I could do on days when the weather or my schedule didn’t permit a run or walk outside. Basically, I started eating less and exercising more, and stuck with it. And it worked! I’ve now lost 40 pounds and reduced my BMI by 6.5 — still in the “overweight” category but out of the “obese” category, which hasn’t been the case in as long as I can remember. Yay me! I worked hard at this, and I did it! Rock star. Way to go, Andrea. Great job on your progress!